This is the Hytrol way to ship conveyor. Everything is protected from the rigors of LTL shipping by crating. Banding is used with cardboard to prevent wear. Smaller units arrive with the belts attached. 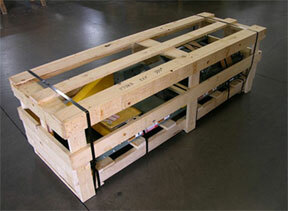 This is a conveyor ordered from another conveyor company. This is how it landed on our dock. 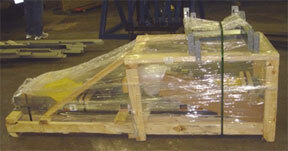 The Hytrol conveyor has a much greater chance to arrive intact, free of scratches or dents and in working order.